This article will describe building Yocto and running QEMU. This article uses virtual machine as below. Install package according to Yocto QuickStart. Download poky which is build tools for Yocto. Run oe-init-build-env which will set PATH to build tools and create build directory. A conf/local.conf defines CPU architecture, build thread number and make -j option number. This article use default local.conf which defines qemux86 as CPU architecture. A core-image-minimal is recipe for building minimal rootfs without X-window package. unexpected failures. It is recommended that you use a tested distribution. It takes 3 hours to build core-image-minimal on this system environment. A size of build directory is about 20GB. If you use core-image-sato for building rootfs with X-window application, a size of build directory will be about 30G. 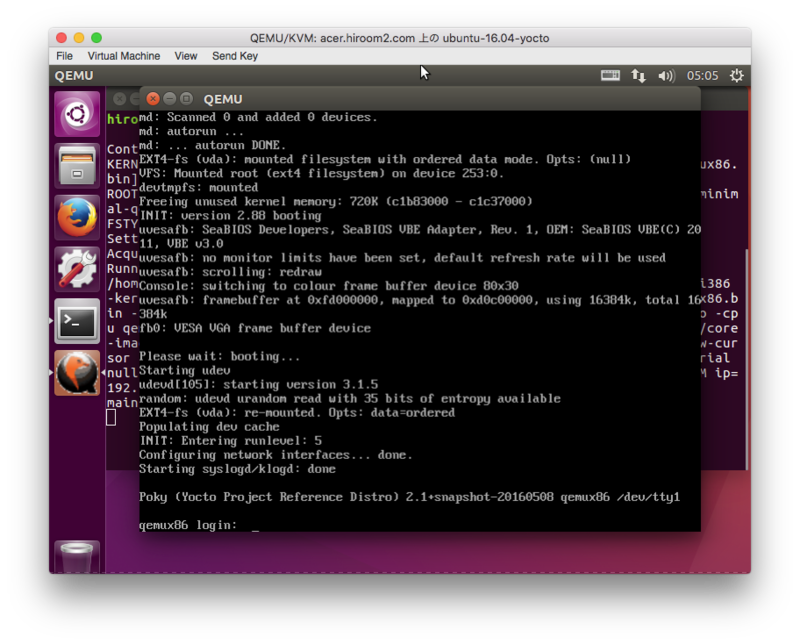 After running oe-init-build-env, runqemu command can be used. Changing console to serial or GDB connection can be used.